The hulking nose tackle, who lost 30 pounds in offseason training, had just run a series of drills for a few NFL scouts at Eastern Washington’s Pro Day. So did about a dozen of his ex-teammates. Tiuli appears to have the best shot of the group in getting drafted in the late rounds – or at least picked up in rookie free agency – when the NFL draft rolls around later this month. Others, like fleet-footed All-Big Sky receiver Nsimba Webster, have also generated some interest. He participated in pro days at Washington State and EWU. Since a Dec. 8 fight and subsequent assault arrest in Cheney kept him from playing in the FCS semifinals and national title game, Tiuli said he’s stayed quiet and been focused for the next step in his life. “I kept my head down these last couple of months and got ready for today,” Tiuli said. The 6-foot-4, 310-pound Federal Way, Washington, product had solid marks Thursday, including a standing vertical leap of 29 inches and a 5.18-second 40-yard dash. He also bench-pressed 225 pounds 26 times. As Tiuli walked away from the media section, former EWU star Samson Ebukam, now a starting outside linebacker for the Los Angeles Rams, joked with him. Ebukam, two months removed from playing in the Super Bowl, knows the value of a good pro day. Like the rest of EWU’s current seniors, Ebukam wasn’t invited to the NFL combine two years ago. When he posted impressive marks and showed off his NFL-ready body to scouts at EWU’s 2017 pro day, it helped him get drafted in fourth round. Former EWU standout Kendrick Bourne, a starting wide receiver for the San Francisco 49ers last season, didn’t get drafted in 2017 but made the most of a free-agency signing, which was helped by a good pro day. Bourne and former EWU offensive lineman Jake Rodgers, recently released by the Baltimore Ravens, were also in Cheney. Among the dozen scouts were representatives from the Seattle Seahawks, New England Patriots and Oakland Raiders. The fastest 40-yard dash of the day (4.49) belonged to All-Big Sky cornerback Nzuzi Webster. Record-breaking kicker Roldan Alcobendas – the 2018 Fred Mitchell Award winner – made a 62-yard attempt in front of scouts. He was there to help his former EWU backup, Miles Richardson, who concluded his career last season as a starter at NCAA Division II Simon Fraser. Richardson, who went into the combine as a quarterback and wide receiver, recently asked Adams if he would throw to him. Ketner Kupp, an All-Big Sky inside linebacker who led Eastern Washington in tackles last season, didn’t have to look too far to get pro day advice. His brother, Los Angles Rams and ex-EWU star receiver Cooper Kupp, has been helpful, said Ketner, who recently trained in California. Kupp ran a 4.73 40-yard dash and marked just shy of 30 inches in the standing vertical jump. He benched-pressed 225 pounds 18 times. All-Big Sky cornerback Josh Lewis’ older brother, Sean Lewis, was a standout linebacker at Central Washington in the 1990s. He had a short stint with the San Diego Chargers. “He really wanted me to focus on bench press,” said Lewis, who texted his older brother to say he had better marks in every drill but bench press. 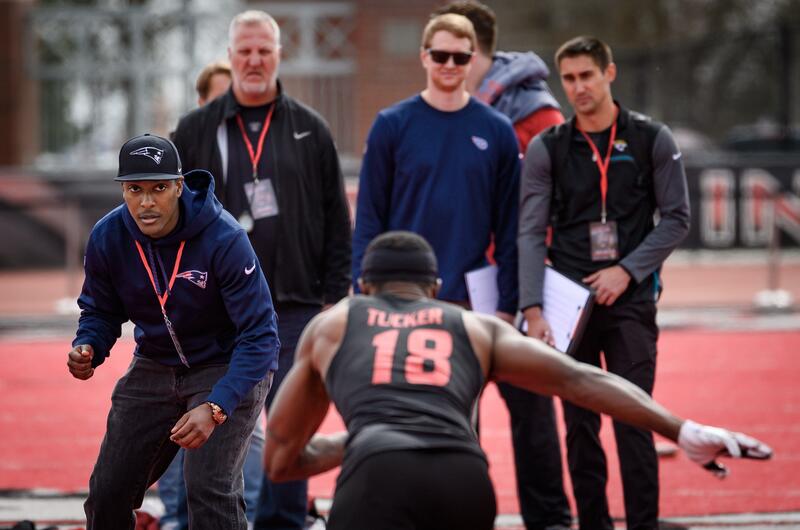 Lewis had impressive marks, including a 37 1/2-inch vertical leap, a broad jump of 10-3, a 20-yard shuttle time of 4.25, a 3-cone clocking of 6.96 and 40-yard dash of 4.52. Lewis and Tiuli played in the NFL Players Association Collegiate Bowl in January, among some of the country’s top seniors. Published: April 4, 2019, 9:39 p.m. Updated: April 4, 2019, 10:19 p.m.